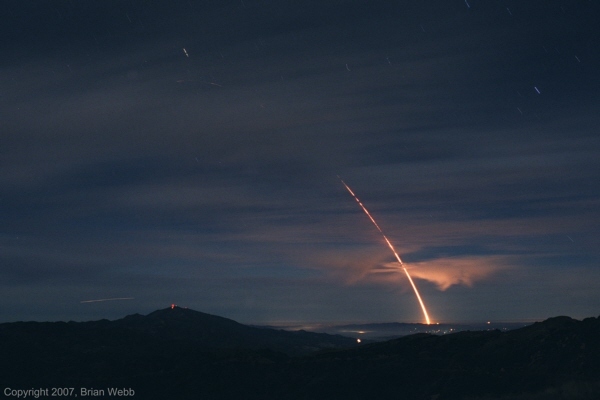 The following image by the webmaster shows the 2007 February 7 early morning launch of an unarmed Minuteman III ICBM from California's Vandenberg Air Force Base. The test flight, code-named "Glory Trip 193GM" began at 00:15 PST and sent an unarmed reentry vehicle on a ballistic trajectory to a predetermined target in the Marshall Islands. In spite of the presence of heavy high-altitude clouds and moonlight, much of the powered portion of the flight is visible. The faint curved horizontal line in the middle left is the trace from the third stage burn. The short streaks are star trails. The thin line near the horizon on the lower left is the trail from an aircraft. 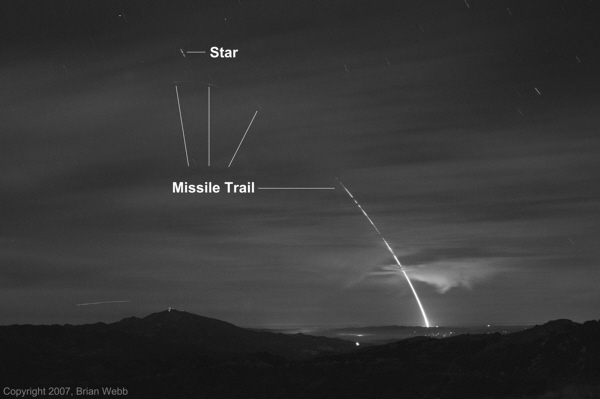 The 3-minute 35-second time exposure was taken from the mountains east of San Marcos Pass in Santa Barbara County and some 50-statue miles from the launch site. The equipment consisted of a vintage Canon TLb camera body, 35mm lens, and Fuji Superia 400 color print film. West Coast Imaging of Oakhurst, California scanned the negative. The most interesting features in the photo are labeled in this version of the image. Copyright © 2007, Brian Webb. All rights reserved.